“There is no future unless you have a real history” is a quote that in many ways puts words on what the brand Roy Roger’s stands for. As the first Italian manufacturer of denim, the company has worked with this never-lost material since the 1950’s, and just like back then, the American cotton is still a product coming from the historical Cone Mills Corporation. Even though the collections today present American as well as Japanese denim, and the washes and the models might be slightly upgraded from the ones produced in 1949, the company has kept much of their original flavor, making it a brand that gains strength from looking back to move forward. It is the small details – such as knowing that the tailors use the same sewing machines as the ones of the 50’s to make chain stitching – that make one want to know more. 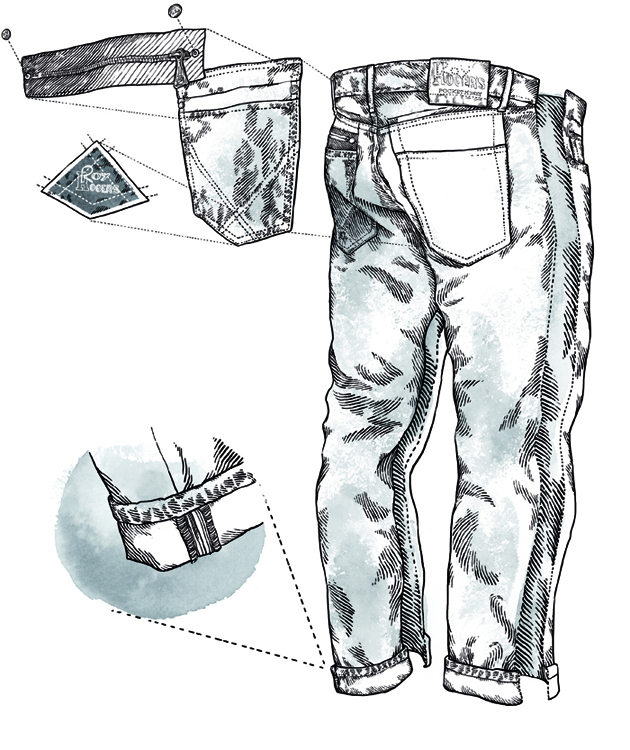 A pair of Roy Roger’s jeans has its beginning in a raw cloth of denim, and before doing anything else, the fabric and the processing of it are studied carefully to learn how the material reacts in terms of washing and shrinking. Design, cut and patterns of the slim fitted jeans are thereafter handed over to the in-house tailors for expert attention to stitching. Much thanks to the internally handled processes, the iconic Roy Roger’s denims from back-in-the-days share several features with the pair of jeans you find in store today. Besides the already mentioned Union Special sewing machines and the fabric coming from the “American temple of denim production”, both the intertwined seams in the back and the double stitched back pockets are the same. Though, the most iconic features of a pair of Roy Roger’s jeans, seen today, might be the features that weren’t thought of as fashion details at all back then. The back pocket zipper, which Roy Roger’s and the founding manufacturer Manifatture 7 Bell have had patented since 1952, and the famous small money pocket in the front, were incorporated to protect the workers from losing the day’s wage when heading home after a long day worth of work. Whether you love a pair of jeans for its functionality and fashion aspects, or for the details that assure you both quality and an amazing history, we have found that Roy Roger’s gives us both. Because, who doesn’t love the feeling of knowing that someone put not only time and expertise, but also pride and joy into the garment you are wearing?